One of the oldest sports known to mankind and still, at its highest level, a test of concentration and physical strength. Fortunately, flexible and efficient modern bows mean anyone can learn how to launch an arrow and be hitting the target. 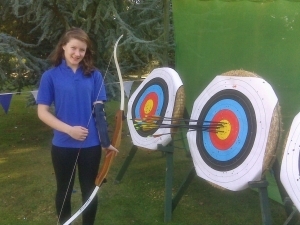 Our Grand National Archery Society ('GNAS') accredited coaches can ensure that everyone is given a grounding in, or reminder of, the safe practices and best techniques that form the basis of good archery. 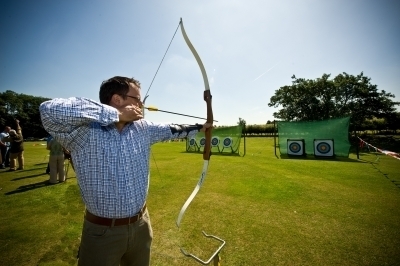 It goes without saying that we provide the necessary safety equipment, the targets and a range of modern bows, but we also have a few specials available for the more adventurous - ever wondered what it feels like to pull back the drawstring of a medieval longbow? Or fire a precision crossbow? Even with superb coaching on hand, you will still need to have poise, mental focus, a good eye and a steady arm to score highly - which means that it usually doesn't take long for (friendly, but...) competitive instincts to surface when there is archery in progress. Not everyone has what it takes to find the yellow, but we like to think that we might turn up the occasional natural talent - see left!